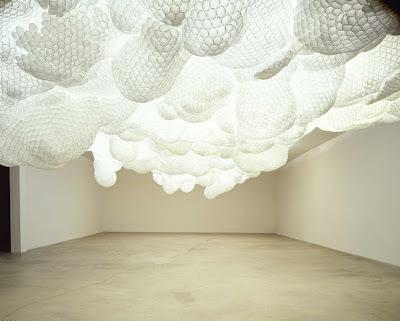 Tara Donovan, Untitled (Styrofoam Cups), 2003, Styrofoam cups and hot glue. Dimensions variable, Installation view, Ace Gallery, Los Angeles, 2005. Photo credit: Ace Gallery, Los Angeles, Courtesy PaceWildenstein, New York. Read about the first major museum survey of artist Tara Donovan who recently won a MacArthur Genius Grant here at Art Daily.